Deborah Greene says it best--"Anyway, then Templeton Properties made an offer. It is interesting to note that Miller Properties and Templeton Properties utilized the same law firm, Deal, Mosley et al. We're these more dubious offers? Somebody needs to explain, without blaming the town of Boone for its longtime, well publicized, no secret, highly controversial, onerous, crippling UDO, view shed, steep slope, water and regulatory background, what exactly has changed that would bring cause to give credence to a bonafide withdrawal of offer? No plans have been submitted or rejected? The county asked for B-3 zoning and got it years ago. Templeton's lawyer, as well as others asked for B-3 exemption under the new regulations. So, please explain what is the bonafide reason for withdrawal. Is it because 'I can.' Is it because the contract accepted by the county was so open-ended? Did our county commissioners enter into a week speculative agreement and turn down a solid offer from outside the county? Ultimately, the 5 bungling commission boards along with the 2 bungling school boards, are accountable for the corruption, fraud and malfeasance that has been and continues to be perpetrated. Stop it! Stop it now. Enough is enough! Stop the political posturing, the childish antics, the violation of open government, and start standing up for the oaths you took for office or get the hell out!" Anyone who can't see that all this is corrupt as hell is blind. Boone should just move on. There's no reason to meet with the county anymore. The fix is in and I suspect was in long ago. 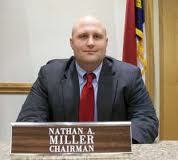 Nathan Miller is corrupt to the core. Always has been. Just look at how he has his hands in every single deal and ends up making money for himself in the process. Think he gives a rat's behind about anything other than his own interests? Give one example. He is even being sued by Murphy's for screwing them over in a purchase deal, where as I understand it Murphy's had first right of refusal on a property, and he and his father (the attorneys for the seller) bought it out from under Murphy's. Boone should join the nascent secessionist movement taking root in Raleigh and sever its relationship with Watauga County completely. Start by putting up roadblocks on every road coming into Boone. Ask each driver his or her party affiliation and then give Republicans breathalyzer and drug tests. They're obviously high or drunk or something. Blatantly corrupt, and surely illegal at least procedurally. Deborah Green finds a conspiracy behind every tree but it's good to know she has so much influence over the Democrat party in Boone. I see you even included her in one of the re3solutions for your county convention. Apparently Blowing Rock, Seven Devils, and Beech mountain think pretty well of Miller. It seems that corruption gets more blatant the bigger the ego grows. Glad to see Deborah Greene is still digging into the doings of government, never thought I'd agree with her assessment either. I have to say she got it right. One good conflict-of-interests deserves another. All of these articles that I've read about this continue to say that "the county" has decided to do this or that, but like many others, I can find no reference to anything that the Commissioners have done in a meeting that authorized Miller to make these statements. It seems as if he's just decided this himself. Is that even legal, to negotiate a deal with other towns to screw Boone without a meeting? This is ridiculous. Like the Boone town attorney being part of the decision making process and then telling the boards what actions they can take. All these comments seem to be coming from the same person.